This abandoned root cellar, located on Thorpe's Road, St. Phillip's, is one of the root cellars that will be documented as part of this summer's Seeds to Supper Festival. This year, the province's third annual folklife festival will celebrate agricultural traditions past and present. 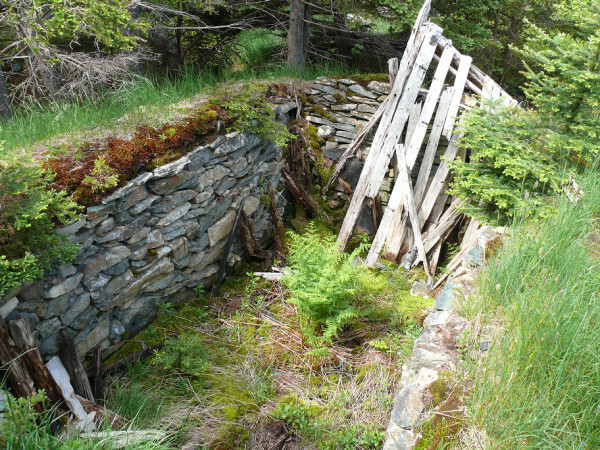 The root cellar research project is being conducted by Heritage Foundation of Newfoundland and Labrador (HFNL) folklore coop student Crystal Braye, and Agricultural History Society intern Julie Pomeroy. The pair will be photographing, measuring, and drawing cellars wherever they can root them out, as well as conducting interviews with root cellar owners and farming families. All collected photographs, drawings and audio interviews will be stored, nice and cool, in our digital root cellar, as part of Memorial's Digital Archives Initiative and HFNL's ongoing Intangible Cultural Heritage inventory. The research is funded in part with grants through the Department of Tourism's Cultural Economic Development Program, and the Helen Creighton Folklore Society.